Life truly begins the moment we step out of our comfort zones and are forced to explore the unknown. Skating through life on easy street, avoiding any and everything that appears complicated, and afraid to adventure into the unknown is a sure-fired way to live a stagnant life void of the euphoria of discovery. It is a testament of faith and determination and there is no doubt that if things in life do not challenge you on a cerebral, physiological, psychological, and emotional level, there is no way growth can take place. 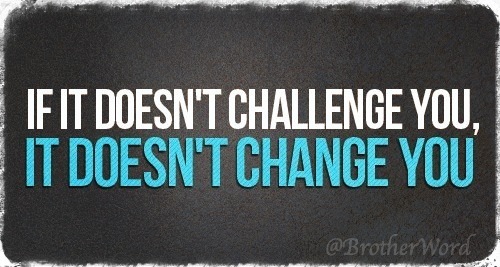 Challenge may be the cause, but change is the effect to help you discover your inner depth. Life is meant to challenge you because with each challenge, a new layer is revealed and you will discover the prowess of your talents, a deeper desire to succeed, and uncanny ability to overcome life’s trials. With every challenge you will be forced to venture from what is comfortable to something that may be unfamiliar, but is uplifting. Let go of the fear of the unknown. The moon was unknown until someone dared to send a man into space. Electricity was unknown until someone challenged contemporary thought and ignored the naysayers. The list goes on and on about all the wonders of life that would have never happened if someone did not decide to challenge the conventional in order to change the future. What is challenging you to make the change the change of your life and are you willing to walk in the unknown to chase your dreams? Change is not a bad thing, especially when that change is the first step towards destiny. Never again let comfortability stifle your growth. If the caterpillar remained on the ground, comfortable to crawl around, afraid of change, how would it ever turn into the beautiful butterfly? When you remain in your comfort zone, you remain grounded, doomed to wallow the on the dirt. But when you accept change, dare to discover the unknown, this is when you sprout wings and gain the ability to fly high, cover new terrain, and see wonders never imagined. Be willing to step outside your comfort zone once in a while; take the risks in life that seem worth taking. The ride might not be as predictable if you’d just planted your feet and stayed put, but it will be a heck of a lot more interesting. ~ Edward Whitacre, Jr.